← What happened to scrub Launch "A"
After the scrub on the launch pad for flight attempt A, we went back to the books, to try and figure out what we could do to improve our odds the next time around. One of our biggest setbacks was the inability make an antenna suitable for our use: We needed an antenna tuned for 149 MHz, not needing a ground plane, weighing as little as possible. 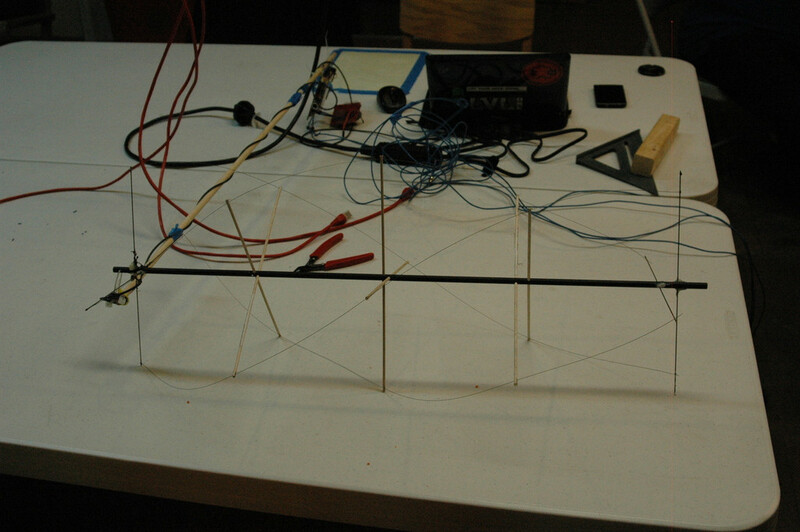 After 4 tries, and some expensive test equipment, the end result was a Quadrifilar Helix antenna weighing only 80 grams! 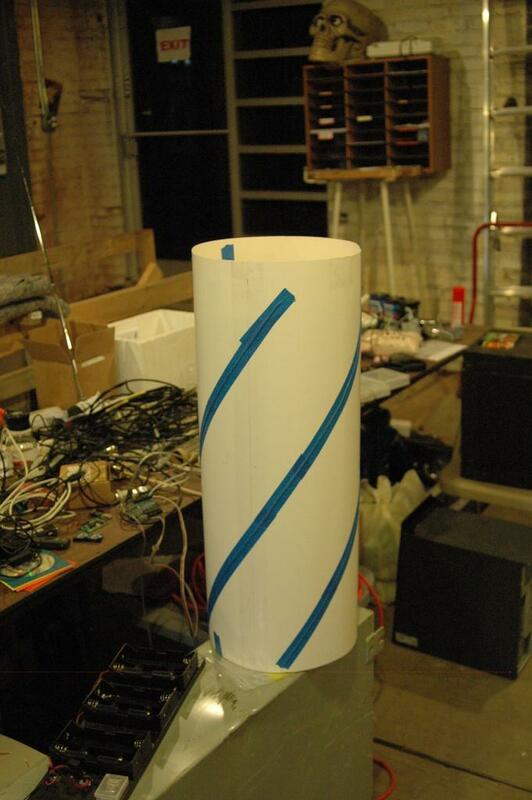 Our ground test antenna was a 5/8ths wave whip antenna, which works well, but unfortunately needs a ground plane. Tests with both a quarter-wave dipole and a J-pole antenna were lackluster. Documentation from our satellite service provider implied that a quadrifilar helix antenna would provide the best coverage at all. While these antennas are pretty, their design and construction was voodoo magic at first. Thanks to some design documentation here: http://jcoppens.com/ant/qfh/index.en.php and some help from the balloon community, we had some baselines for creating such an antenna. We still went through *quite* a few revisions. We went through 3 revisions that didn’t work, and one which works pretty darn well! 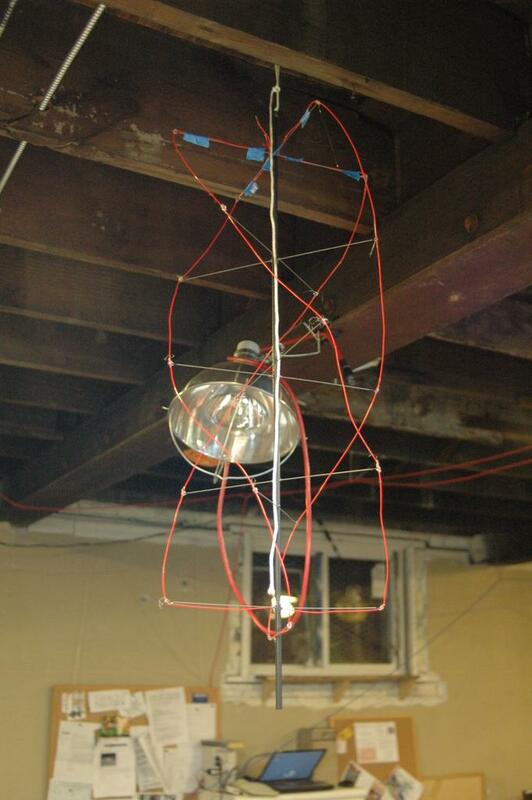 And Finally, this is the antenna that DID work. This antenna worked after we finally broke down and purchased an MFJ Antenna Analyzer. The antenna analyzer allowed us to very precisely tune the antenna. 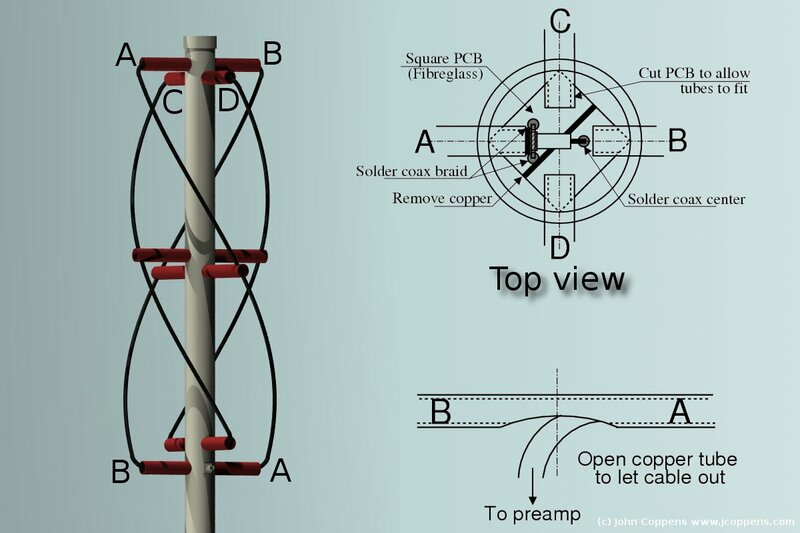 A Quad Helix antenna is two full-wave loop antennas, wrapped in a helix, and shorted at the feed-point. One loop is tuned slightly above the target frequency, and the other loop is tuned slightly below the target frequency. This affects the circular polarization which makes this sort of antenna exceptionally suited for satellite work. The antenna is constructed of fiberglass, wood, and music wire. The central support is 5/16ths inch fiberglass rod. This is sold in 3 foot lengths at hobby stores as a push rod kit. Look near the model airplane parts. 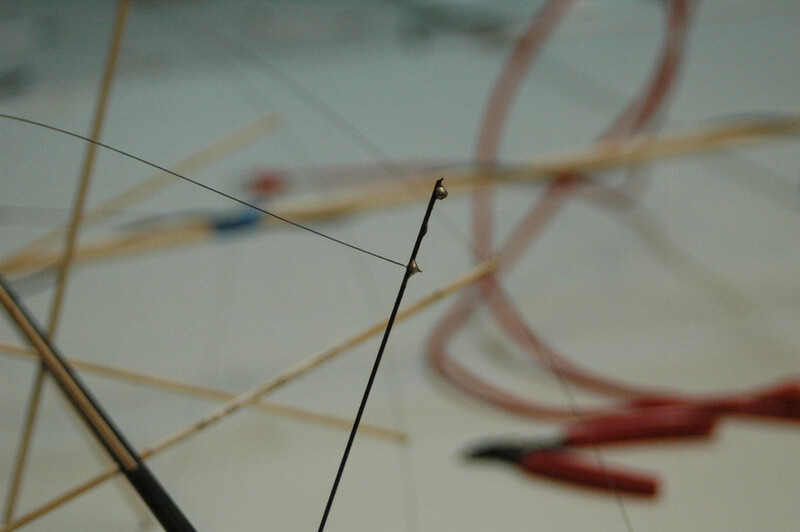 The non-conductive cross supports are 1/8th inch dowel rod or bamboo skewers. The conductive supports are made of 1/16th” music wire, and the helix elements are much, much smaller music wire. Music wire is spring steel wire, and can also be found in hobby stores, near the model airplanes. In order to maintain the helical shape of the antenna, it’s VERY important to precisely measure the lateral placement of the supports (where they fall along the length of the rod) and their angle. It is surprisingly difficult to mark a black fiberglass rod! 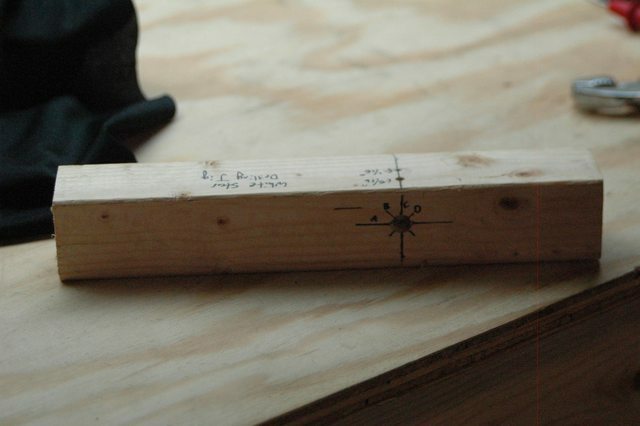 The most effective means I found to mark the rod was to take the rod against a 90 degree angled surface, such as a door jamb, and run a file between the edge of the jamb and the rod. This engraved a straight reference line into the fiberglass rod. The rod is marked for length, based on the dimensions given in the earlier calculator (with some additional slack for tuning!) divided by 4. The supports for the long and short loops are offset initially by 1 cm, to give room for the cross-braces to cross paths. Then, I made a jig to hold the rod and drill holes for the cross-supports. Using a drill press, I simply made a made a reference hole, then marked the centerline of the hole with a carpenter’s square. Pilot holes were drill perpendicular to the rod hole by a trial and error method (this is the 3rd iteration of the jig). Then, angle guides are drawn on the rod hole, to give an angle reference. This is also done with the carpenter’s square, believe it or not! It could have been done more precisely with some actual drafting tools, but we work with what we have. After all the holes are drilled, the music wire and wood supports are cut to length, and placed in the drilled rod. At the feed point, the two halves of each loop must be insulated from each other, so the wire is cut in half, and coated with liquid tape before being inserted. Hot glue provides some structural support here! In order to solder the helix element wire to the thicker support wire, we had to use silver-bearing plumber’s solder, and plumber’s flux. You’ll also need one heck of a soldering iron. 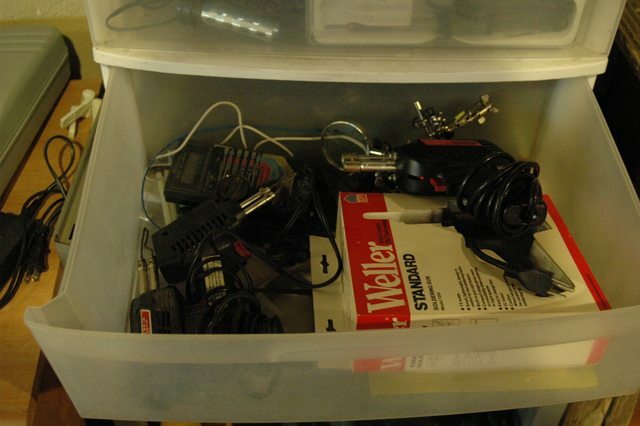 At LVL1, we’re lucky enough to have a box full of killer irons. Unfortunately, only the 260 watt iron here worked! The 120 and 140 watt irons didn’t heat sufficiently to create a good joint. After about an hour of tuning the antenna, we killed the 260 watt iron, and had to switch to a butane soldering torch (which also worked well). After soldering each of the connections, it was simply a matter of hooking each loop individually to the tuner, and shortening the length of the loop until it tuned at the desired frequency. (After some potentially heretical advice, we adjusted the one loop to 149.5 MHz, and the other to 148.5 MHz). This takes a lot of time, but can be summed up quickly: shorten each loop by 1cm at a time until you’re there. For no particular reason, we also put 4 turns in the coax near the feedpoint. It can’t hurt. With all the coax, but without considering the dowel rod you see in the 4th picture, the antenna weighs a stunning 80 grams. This is under 3 oz! After configuring both loops, and hanging the antenna in free space, we saw resonance and SWR dip to 1.2:1 at 149MHz. PERFECT. 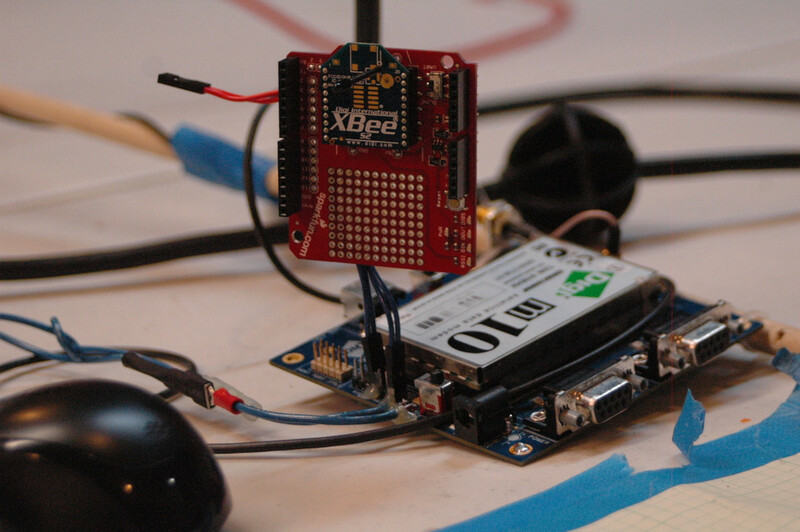 In order to test the antenna with the Digi M10 Dev Kit without staying outside, Dan and I rigged the dev kit with a 2mW Xbee Series 2.5 as a wireless serial link. Now we can be up to 500 feet away while we test our antenna. This means no more late nights in the parking lot! Unfortunately, the receive performance of this antenna is not so great. The satellite beacon signal is around 137 MHz, and our antenna is tuned for 149 MHz. The modem won’t transmit unless it can hear the beacon signal. Whenever it keys up, however, those packets fly out. We’ve never seen any performance like it. Great post! I really appreciate the wealth of information and experience presented here. I’m rooting for the SpeedBall missions! Alternative hint for marking the black fiberglass rod: use a silver Sharpie. It is common practice for all the guys making airplanes from carbon fiber cloth. What is the SWR at 137 MHz ? Love the article, thanks for posting. Well done lads! 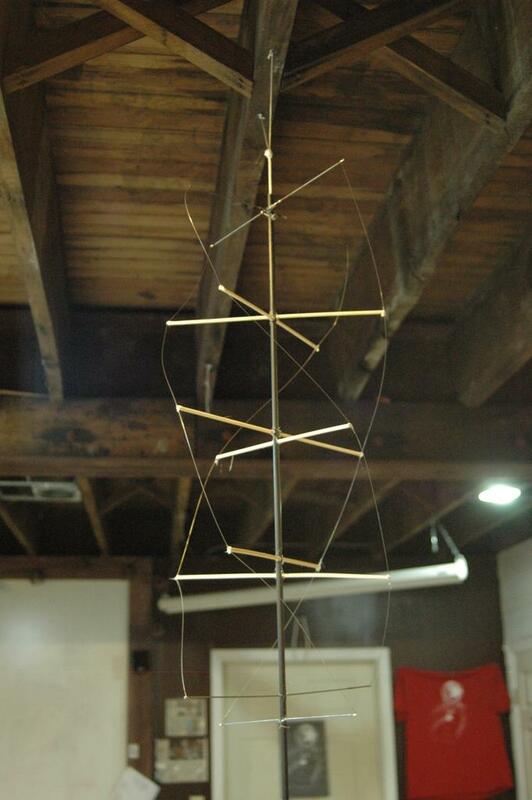 Try lengthening the center mast and the radials slightly and tune the antenna to 144 MHz. This should give your antenna “access” to both target frequencies (137 – 138 MHz and 148 – 150.05 MHz). Our “commercial” QuadHelix for Orbcomm is much larger and heavier (see: ) so I applaud your efforts and anticipated success. great write up and progress!! When I first saw the helix and the lightness requirement in the same context as balloon flight, I thought why not make a cylindrical balloon and wrap the antenna wire around the circumference? Could be light and even might be negative weight if you play your Helium right. Now it looks like you want the radii of the helices to be different, so I guess that would be harder to do with a balloon. Ah well, good luck with the flight.